There is a resurgence of prosperity slogan in Nepal. This time around, the political platform from which this slogan has come is shaped by nationalistic ethos, which in a way brought this government in power. Contrary to its ideology, it aims to achieve prosperity by channelling funds from foreign aid and foreign investment. But like all the past governments, the government of K P Oli has overlooked a source of great deal of revenues and income, which could possibly be the alternative of foreign assistance: Forests. Researchers have shown that if forests are used sustainably and efficiently, they could generate income worth 373 billion rupees per year. Unlike other potential sectors like hydropower, which require huge investment, utilizing forestry sector just needs a right policy and commitment. Compared to other countries, Nepal has relatively high proportion of its geographical area covered by forests. 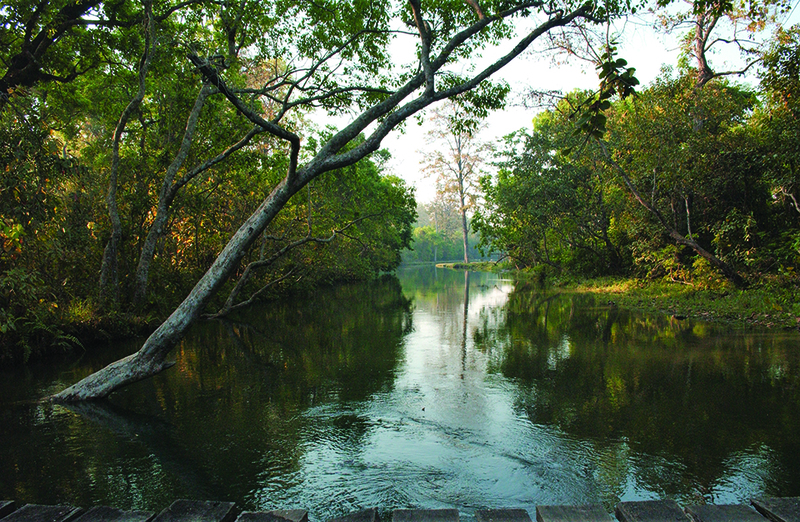 The latest forest resource assessment has confirmed that forests cover about 45 percent of total land area. In a land scarce country, commitment to keep such a large proportion of area under forest does not make a sense if this resource cannot generate revenue for the development and to augment household income and livelihood. Given that there is low productivity in agriculture sector, small or insignificant industrial base and diminishing labour force, it would be prudent to tap the potentials of forests and forest-based enterprises. Nepal is spending a lot of hard-earned money to import timber and readymade furniture from countries like Indonesia, Malaysia and China. Nepal has now become a net forest-product importing country. This year, Nepal imported logs and wooden produces worth four billion rupees, which is about 33 percent increase from last year. If this trend continues, Nepal will be importing 10 to 15 billion rupees worth of timber and wooden items every year. This magnitude of import is frustrating as Nepal can substitute these products on its own. Why has Nepal failed to realize forestry potential? After analysing forestry policies, I have come to the conclusion that high-level policy makers are aware about potentials of this sector and the risks from importing logs and furniture. There are policies in place to deal with this situation as well. However, these policies are either not implemented because of political and bureaucratic bottlenecks or have been proved wrong when implemented at local level as they do not take into account local realities. I have found three major policy hurdles that have restricted growth of forestry enterprises. First, forest policies are crafted from conservative perspective. In order to look ‘greener’, policy makers often emphasize conserving forests for environmental protection only. Such policies have failed to appreciate the fact that forests are renewable resources and that they can be restored after mature trees are harvested on a sustainable manner. Even the seemingly enterprise-friendly policy provisions as stipulated in the constitution and other laws have not yet improved business prospects for forest-based entrepreneurship as these overarching policies are constrained by norms, and practices at local level. Such situation distracts investment in forestry business. Banks and private firms are not much interested to invest in this sector. Second, policy instrument and implementation mechanisms at local level are devised or interpreted in a way they often heavily constrain the establishment, operation and growth of forestry enterprises. Often these policy instruments are complex, impractical, conflicting and subject to personal judgement. Enterprises require a predictable supply of raw materials. However, the policies make forest product supply almost always uncertain and unpredictable. Even a memo from a government official or ministerial decision(s) can instantly suspend ongoing harvesting process or impose a time-bound ban on scheduled harvesting, irrespective of how and whether they comply with the existing law. For example, an ad hoc government decision of forbidding felling of green trees in 1999 crippled the timber trade and ceased operation of saw milling facilities. Some of the rules are rather ridiculous. For example, furniture factories are not allowed to saw tree logs, which means farmers adjacent to the furniture factory should either transport trees to far away sawmills or depend on costly, inefficient and slow manual sawing. Practical difficulties also arise from unclear and conflicting rules. One government office allows entrepreneurs to establish their businesses anywhere in industrial estates, district headquarters and municipalities, but the other office forbids doing so in municipalities other than the selected 58 municipalities. Third, forestry entrepreneurs have to deal with authorities, often competing with each other in terms of power and jurisdiction, to obtain permissions required for running their businesses. These authorities set one way of issuing permits and monitoring activities, and many times they are also contradictory. For example, existing rules require that forest office, cottage industry office and cadastral survey office in the district must carry out field inspection and verification before issuing permission to register forest-based enterprises. In practice, entrepreneurs have to invest significant amount of energy, time and resources to coordinate these officials for a joint visit. So entrepreneurs often say registering forestry enterprises is a herculean task. The whole forestry enterprise sector has suffered because of such restrictive policies. Under the new constitution federal, provincial and local governments have been formed in the country. These governments should make policies and rules to promote forest-based enterprises and develop mechanisms to ensure implementation of those policies. Mere amendment in existing systems and rules might not be enough. There should be a thorough reform in forest policy to create a business-friendly environment for forest entrepreneurs. Only then will we be able to enhance forestry enterprise and thereby generate income and employment from it. People will also feel motivated to preserve forests then. 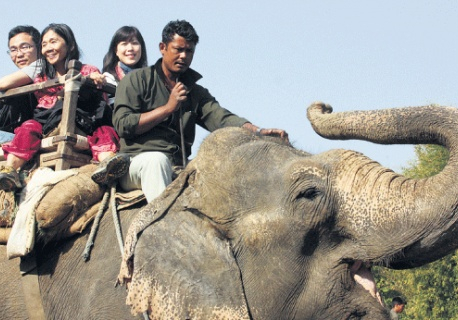 RATNANAGAR, Dec 12: Four community forests along the Chitwan National Park (CNP)'s buffer zone have got permission for operating elephant safari.